thought about turf for terrace then we decided on slate with it only being about 4foot wide, a bench compiments it and a nice place to view, now about that tree cant stay there . You have a beautiful garden Diggerman60...:) Welcome to GOY!! Very well tended with lovely full borders, and a great seated arbour to relax in. Welcome to the large family of garden lovers. 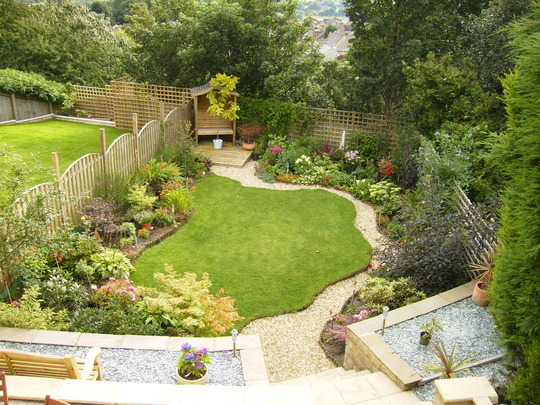 Your garden is stunning, with loads of interest. I am a novice gardener and would love my garden to be as pretty as this with the lovely shapes and colours. rectangle anymore. Welcome to GoY. Your lawn area and borders are so amazing....I really like that it isn't conforming to the plot of land with straight borders and grass. i love it great design it realy draws tour eye down t6o the end . the tree mite work in the grass in the right place you know diggerman . Such great use of a small area..
i have alot 2 learn! your garden is stunning.